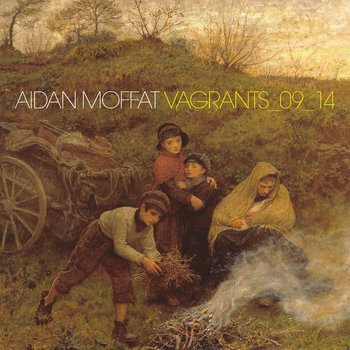 Aidan Moffat-VAGRANTS_09_14 | Give it a spin! Award-winning culture hub & radio show! Listen to ‘Wild Roses’, the ﬁrst release from Monelise’s ‘Hauntology’ album! These are the vagrants, begging for change by the side of the superhighway, the abandoned hobos brushing off digital dust and leaping from the virtual shelf … otherwise known as the rarities compilation. Six are unleashed for the first time, while four of them have either popped up on vinyl somewhere or were floated online. There are three covers but the rest are all mine, and they’ve all been professionally remastered as a whole for your optimum aural delight, available exclusively in the form of a digital album. Yes, sadly there will be no physical release of this album, though it was carefully considered – mainly because I really like the cover – but I just don’t want to make too much of a fuss over it, plus I haven’t really got the time to post out LPs. So apologies to all of you who quite rightly love vinyl and also, of course, to the real record shops who would normally stock my wares – I can assure you that my next album proper will be as tangible as they come. Danish band MALMØ share “The Way” (ft. Eivør)! Give it a spin! is an award-winning music and culture website based in SKG, Greece. It's also a radio show dedicated to handpicked taste-making and supporting creativity from every place on earth! Keep spinning! Listen to Taylor Hamilton's debut track 'Might Say'! Μια εναλλακτική άνοιξη, 'Les Electrofleurs Du Bien' η διπλή tape συλλογή της Gross Diskos! Sarah P. releases the final chapter of Maenads video trilogy! Get ready for KRAMA festival (19-20 April)! The power of Tess Posner's 'Supernova' on International Women's Day remains forever!